If it looks like I’m fawning, it’s because I am. 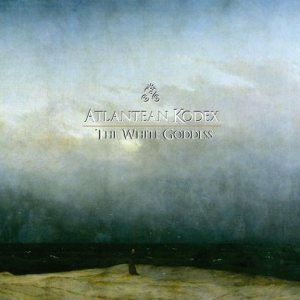 First there was that magnificent Fire on the Mountain album by Twilight of the Gods, and now there’s The White Goddess, the sophomore album by German epic metallers Atlantean Kodex. If it seems like I’m overdoing it with the superlatives by labeling both albums as “the best metal albums I have heard in years,” it’s because it is a bit too much. Problem is, it’s also very true. Just like Twilight of the Gods’ debut, The White Goddess is a heavy metal masterpiece, hewn from the same vein of traditional, early eighties metal. It blends that same Manowar-esque grandness with that epic Viking sound of late Bathory. What the German band does on The White Goddess, though, is up the ante a notch and deliver an album that might even be too epic, if such a thing exists. Of course it doesn’t, but it’s the only adequate way of describing just how bloody massive the thing sounds. The White Goddess opens with the instrumental Trumpets of Doggerland (There Were Giants in the Earth in Those Days), in which you can hear gusts of wind racing through cold mountain passes and horns blown by burly men from ancient villages where everyone is stout and mead is drunk from horns. Surely you can see where this is going? The album starts off properly with Sol Invictus (With Faith and Fire), a song I would label long, were it not for the epic running time of the rest of the songs. With an average running time of about ten minutes each, not counting the instrumental prelude and interlude, this is one collection of long songs, indeed. Sol Invictus, however, neatly sums up all that is The White Goddess in a nutshell. It’s suitably heavy, ridiculously catchy and the chorus is absolutely massive. It’s a blueprint for what the rest of the album will be like. With only five real songs, you might think that The White Goddess is a short album, or at least one that would become boring soon, and that’s understandable. Luckily, however, neither is true. Clocking in at little over fifty minutes, this is an album that is long enough without overstaying its welcome. And the songs are long and varied enough to discover something new on the first dozen spins. Heresiarch (Thousandfaced Moon), for example, sounds like two songs anyway, with a very straight-forward first half and a second half that trails off into mesmerising and more dreamy soundscapes. Twelve Stars and an Azure Gown (An Anthem for Europa) is a very melodic song with great twin guitar leads, whilst Enthroned in Clouds and Fire (The Great Cleansing) could have been on Bathory’s Hammerheart or Twilight of the Gods, with its keyboard chants, slightly off-beat drums and overall One Rode to Asa Bay atmosphere. It’s pure Bathory, but with a better vocalist (Markus Becker shines throughout the entire album) and better production. If there’s one epic, traditional metal album you buy this year, make sure its Fire on the Mountain. After that, immediately buy Atlantean Kodex’s The White Goddess. Better yet, order them together and save on delivery costs. Really, if there ever was a good time to be into this type of heavy/doom, this is it, and these are two albums that a fan of these sort of sounds cannot afford to miss. This entry was posted in RP and tagged Atlantean Kodex, Bathory, Fire on the Mountain, Manowar, The White Goddess, Twilight of the Gods, Ván Records. Bookmark the permalink.